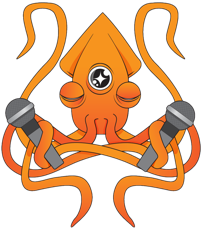 Studio Squid Audio Productions provides artistic and professional recordings. aimed at focusing your creativity to obtain your best performance. In the Studio, in your house (do you own an amazing piano?) or at your favourite venue (Melbourne Unclaimed). Made almost entirely of recycled materials and building offcuts and soon to be solar powered, studio squid provides you with a great sounding and comfy setting to record and produce any style of music. Head engineer Frank Pearce has over 12 years of experience, recording live and in the studio. The main aim of a Squid recording is to fully capture the performance and give depth to people's artistic creation. This is achieved with a fully transparent and open mixing process where the band has full creative input as to how their recording is mixed and presented. "I intend to work with artists to achieve the best possible outcome and produce recordings that speak emotionally and provide the representation that is deserved. Too often artists are taken out of the creative process during mixing and they are left thinking they could have done more." Please e-mail me via the contact form if you would like a more accurate quote. As recording jobs vary in approach and technical prowess, we can explore which techniques would best suit you and your budget. Frank's theory: To understand the musician as best as possible and work hard with the artists to achieve the best and closest possible result to the artists vision. Full artistic license is yours and good communication is a must. Frank Plays Jazz & Contemporary music, is a composer with education at Box Hill Tafe and Monash University to pursue his musical knowledge. Frank has been recording and playing for over 15 years. This enables a musician to musician dialogue which can produce amazing results..